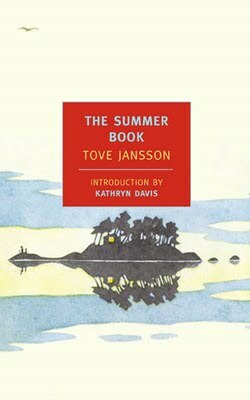 Last week, we had some beautiful days of gorgeous weather, so I decided it was the perfect time to read Tove Jansson's The Summer Book. The only previous experience I've had with Jansson is with her book The True Deceiver, which is set in the deep of winter and has a different atmosphere entirely to this one. Though not so different that you can't tell they are written by the same author. I was quite excited to read The Summer Book because it seems like most people really love it. It's more a series of short stories than one cohesive novel, all centered on a young girl, Sophia, and her grandmother. Sophia's mother passed away recently and she's taken care of by her father and grandmother on an idyllic little island. Sophia and her grandmother spend their days together traipsing through the woods, going to the beach, flying kites and doing other lovely activities, all the while talking about life, love, death, and other important matters. I am sorry to say that I didn't really like Sophia. Maybe something was lost in translation but it seemed like Sophia never just talked, she was always shouting or yelling. Granted, she's six. So... well, she probably did scream a lot, but it got exhausting even for me to just read about it. That said, I do think that Jansson captured Sophia brilliantly here. I don't know many six-year-olds, but I think that Jansson probably did because the way she shows Sophia's short-term thinking, her ability to jump from one topic to another, her passions and her boredom, is just so spot on. She doesn't make Sophia out to be some sort of angel - she really does humanize her and shows us childhood, warts and all. I did really like Grandmother. Similarly to how she portrayed Sophia's youthfulness so wonderfully Jansson is fantastic at conveying Grandmother's mortality. She gets exhausted quickly but doesn't want to show it. She has lived a long and full life that Sophia doesn't even think about. In every story, I was vividly aware that Sophia would not have her grandmother around for many more years, and it made me so sad for her. I admit I did not love this book the way that I expected to. I don't blame the book, though, which when I think about objectively, really does sound quite lovely and just the sort of book that I would really enjoy. I love vignettes! And stories about young learning from old and vice versa. And as someone who loved reading about Anne Shirley, who also grew up on an idyllic island, I feel like I should really like this book, too. But I didn't adore it as much as I expected. I think it's one I'll keep on my shelf to read in another few years, though. Have you ever read a book and just known that if you read it again, you would have a totally different experience of it? That's how I felt reading this one. That is too bad. It sounds like a lovely book and I was initially excited about your description, but on further reading I think I would have the same problems with the story that you did, and that is unfortunate. I wonder if it would have been a more enjoyable and successful work if she had made the protagonist just a bit older. Definitely, there are times you know you're not in the right place to read a book, but you do anyway, and know you'd like it at another point in time. Sophia didn't sound too bad, but if she really is yelling all the time... It does sound as though something was amiss in the book, rather than it being an issue of timing for you. Hmmm, I can't say I have had much experience with the thought of 'maybe I'll like a book more the next time I read it' but I do think I could come around to such thinking. I was wondering about The Great Gatsby for one. Seems a book that would have different meanings and impact with each retelling. And I do have a book I want to read again someday (and you know that's not like me!) AND I keep wondering about reading books I know I read 30 years ago and wondering how I will react. Like Slaughterhouse Five. SO yes, maybe. I hope the next time you read this one, it will give you a different/pleasant experience. Happy Summer! I'm one of those who loved this book when I read it. The setting of course was an enormous boon. I love islands! Anyway, I have had the feeling with some books that I didn't give the book the ideal mindframe. Either circumstances caused me to read it in fits and bursts (rarely helpful to the reading experience) or I went in with certain expectations, or riding off the mood of the book previous or whatever - just sometimes I have felt the "it's not you, it's me" thing with certain books. I agree with you 100% on my ultimate feelings on this book. I'm glad I'm not the only one that wasn't in love with it.